I still remember the gate that led into my backyard when I was a child. I can still hear the sound of the latch as it was lifted and the squeak of the gate as it was opened. Why do I remember it so vividly? That gate was the entrance into one of the happiest places of my childhood. For countless hours I would stay in that backyard playing with my dog, swinging and having one imaginary adventure after another. Psalm 100:4 mentions another gate. It is a gate that leads into the courts of God. 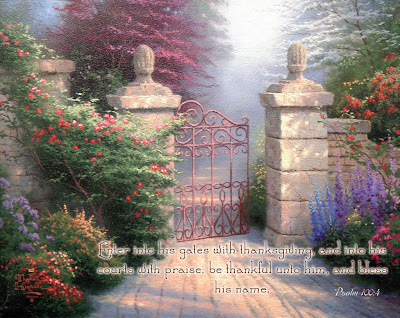 In other words, it is the gate that leads into a place of worship and communion with God. Psalm 100:4 tells us that we enter into the presence and worship of the Lord God through thanksgiving and praise. This is a gate that I choose to enter every day. As I begin to thank the Lord and praise His name, I become aware of His Presence, His love, His grace—of His countless characteristics! How often do you enter the gate of the Lord through thanksgiving? In Old Testament times the Levites were designated as helpers to the priests. One of their duties was to stand every morning to thank and praise the Lord. They did the same every evening (Leviticus 23:30). Wouldn’t it be wonderful if you and I started every morning by thanking the Lord and ended every day doing the same? Certainly, beginning and ending every day with thanksgiving to God would help keep our thoughts centered on God throughout each day. “Count your blessings, name them one by one.